Simeon Robe talks with other cadets while making a rope bridge. He stressed the importance of trust and teamwork in ROTC. Most college students spend Saturday morning sleeping off hangovers. Not Simeon Robe. Instead, he's carrying around a 35-pound ruck sack for six miles, making a bridge out of rope and doing as many pushups as possible in three minutes. 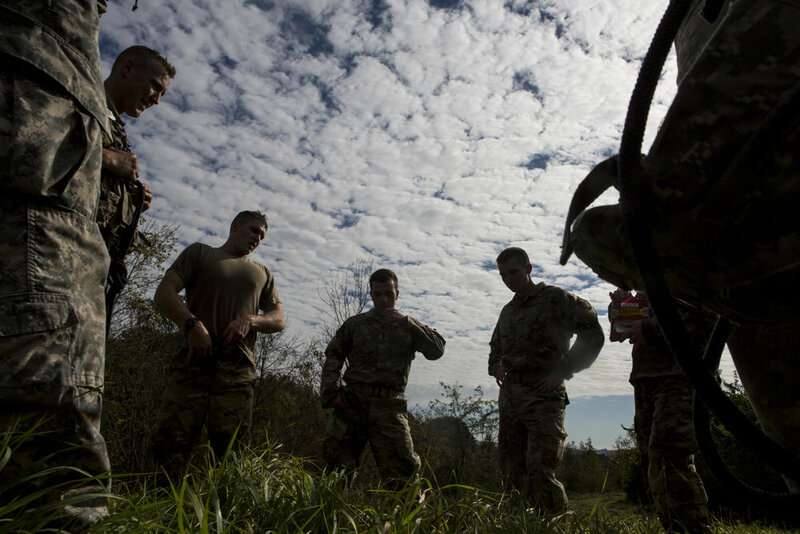 The life isn't for everyone, but it is the reality for some cadets in the Bobcat Battalion of Army ROTC. 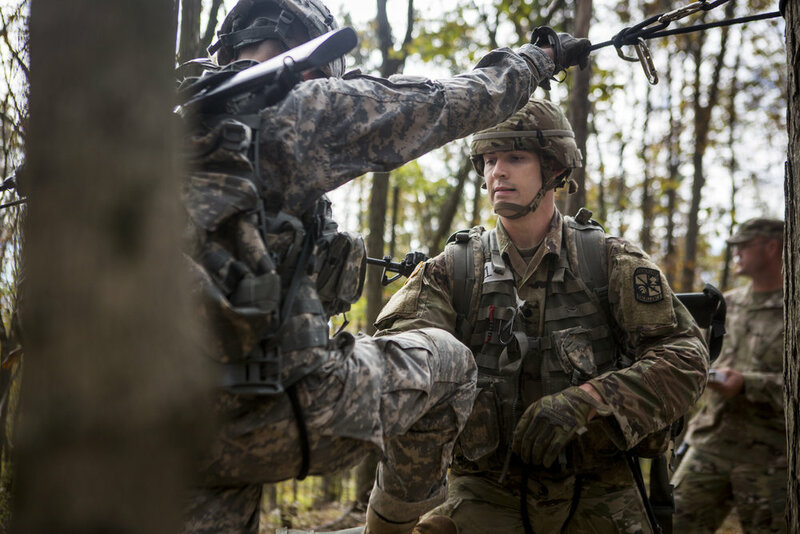 Robe didn't even have to participate in those events, but chose to compete against cadets from Ohio State and Capital University in the Army Ranger Challenge, a series of tests to determine whose cadets are the strongest and determined and work best as a team. Simeon Robe puts on his jacket. He opted to compete in the Ranger Challenge by choice. Simeon Robe competes in the push up contest. He completed 104 in three minutes. Robe said teamwork and trust are important in the army, as he learned to trust his fellow cadets and the hierarchy of the army. Within that system, he learned more about confidence. "You've spent the time, you've learned skills and you'll be able to use them later and that will make you more a more effective leader, a more effective person," Robe said. On the day of the Ranger Challenge, he exudes confidence. The work is grueling, and although he is sweaty, hungry and exhausted between events, Robe walks around singing army songs, exchanging banter with fellow cadets and encouraging those around him. After all, an important lesson learned from the Army is the importance of helping others and doing what's right. "It's important to see if someone is in need, you should help them," Robe said. "If someone is not as strong, you should make sure that other people aren't either attacking, killing or hurting them. I think that's a really important principle that can carry over as an individual serving in the Army." Simeon Robe charges up to The Ridges with 35 pounds of gear. In reality, combat would mean carrying closer to 80 pounds of gear. Simeon accompanies other ROTC cadets as they head toward the site of the rope bridge, a test of teamwork and technical skill. Simeon lifts another cadet onto the rope bridge. Teams used rope to create a method for crossing the "river" without getting wet. Infractions were incurred for touching the water and other offenses. Cadets gather for the push-up and sit-up contest. Some cadets were able to achieve over 100 push-ups in two minutes. Simeon takes a break with cadets as they crack jokes and share light moments before getting serious about the competition again. Simeon grew up in Athens County, playing baseball for a while before switching to soccer. There were some great guys on the team, he said, until they left and left a "less desirable crowd" to hang out with. Some of the people ended up having drug and alcohol problems. The soccer kids, however, were different. "I transitioned from very like 'bro' baseball culture to more of a finesse," Robe said. "A lot of kids who played soccer – their dads are engineers, their dads are scientists." Robe had a lot of different influences growing up, with an "intellectual" component coming from his proximity to Ohio University. "If you're a man, you're intellectually sound, you can use your mind," Robe said. "You can think, you don't just go around grunting and moving things." He was also guided by his exposure to religious men growing up. "It's what you do in the countryside, it's a good thing," Robe said. "I think that's what influenced, 'That's what you do as a man. You get up on Sunday morning and take your family to church.' "
Now, with the framework of the Army to help him, Robe has found that you figure out who you are and what you stand for pretty quickly in the military. "I think the military helps you with your identity in the fact that it gives you more intense situations where you have to figure out who you are," Robe said. "You figure out, 'Ok, this is what I got to do and this is part of who I am now. And if you don't want to do the Army, then you should get out.' "
Simeon Robe takes a break with other ROTC cadets. Cadets encouraged each other throughout the day, encouraging each other to go the extra mile.